The British Basketball League are extending their reach to both existing and potential new fans after a signing a deal with FreeSports who will broadcast a number of games during the remainder of the season. Starting with the BBL Cup Final on 28th January at Arena Birmingham, the recently launched free to air sports channel will show one game per week each weekend. Agreed in conjunction with BBL Rights owner Perform, the agreement will see the BBL being shown across a number of platforms and will complement existing weekly coverage by both BBC Sport and UNILAD- as well as Livebasketball.tv who show every BBL game. 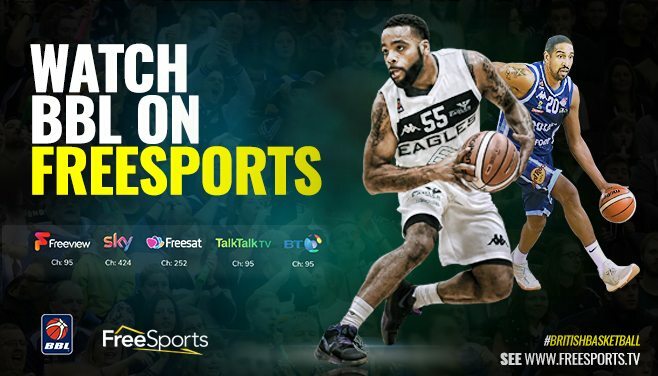 Richard Webb, Operations Manager at FreeSports commented: “We are delighted to be showcasing the UK’s top basketball League on television and thrilled that we can bring free access to over 18 million UK homes. BBL games to be shown LIVE on @FreeSportsUK – available in over 18 million homes! ? Weekly game starting with Sunday's Cup Final ? BBL Commercial Director, Bob Hope added: “In an exciting development we would like to welcome FreeSports as a brand new BBL partner. FreeSports is to televise 15 live BBL games, commencing January 28, 2018 to the end of the current season. The additional exposure this provides, will give The British Basketball League unprecedented media coverage, substantially increasing our viewing audience of League games and adding further to our commercial appeal.